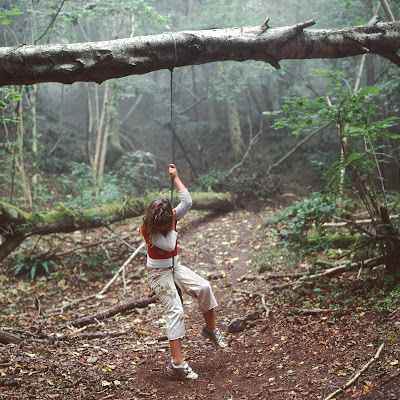 Hanging on the short rope, Brown's Folly - from the rope swing series. I'm looking to tie these in with The Sofa Portraits, Life on Mars, Flora and other series to form a wider portrayal of interior and exterior life entitled The 7 stages of an Idealised Childhood. That image fits in wonderfully. More metaphorical than the Sofa work, in the best kind of way. This, with the images of her running, should be the next collection. When she is small amidst the land, it all seems to become a big metaphor in this project. Thanks Tim - that's the intention but it's all kind of loose at the moment - I'll make the work and tighten it up. The running fit in and the rope/swing series might fit in (there's this introspective, metaphorical side and then a more adrenalin, flighty side). Eventually I want to edit everything down and tie it together, in chapter form, into something resembling the title. Can you see that happening? Does that make any sense?